O'Donnellan and Joyce is offering for sale a beautiful four bedroom detached family residence located in the much acclaimed residential development of Uillinn, in the heart of Moycullen village, Co Galway. Homes in this idyllic location rarely come to the market, making this one of the finest family homes to become available for some time. No 56 Uillinn is situated in a prime position within this development, overlooking a large communal green area to the front which is the ideal space for children to play safely and meet new friends. This is an exceptional opportunity to acquire a significant detached residence which has been beautifully decorated and exceptionally well presented and maintained by its current owners making it the ideal family home. This property boasts spacious accommodation that offers every facility a family would require for modern-day living. The accommodation comprises a bright and spacious hallway with beautiful oak flooring and under stairs storage that is plumbed for a washer and dryer and a separate large downstairs guest WC. The heart of the home, the kitchen, is open plan with the dining area and a family lounge area. To the front of the property, boasting a large feature window, is a main living room with solid timber flooring and feature fireplace with stove. A separate utility room completes the accommodation on the ground floor. Upstairs the accommodation comprises a bright landing area with hot press containing ample shelved storage, a main family bathroom, and four spacious bedrooms. Two of the bedrooms are large double rooms offering en suite bathrooms. Outside the property has a tarmacadam front drive with ample off street parking, two gated side entrances. and a large private walled and tree lined west facing private rear garden which is not overlooked. The rear garden also has a wonderful paved patio area and a separate timber shed. It is within walking distance of the popular village of Moycullen, and has much to offer in terms of schools, shopping and dining facilities, such as the well-known White Gables, and much more. It is an ideal location for fishing enthusiasts with easy access to Lough Corrib, and is also located on the gateway to Connemara. 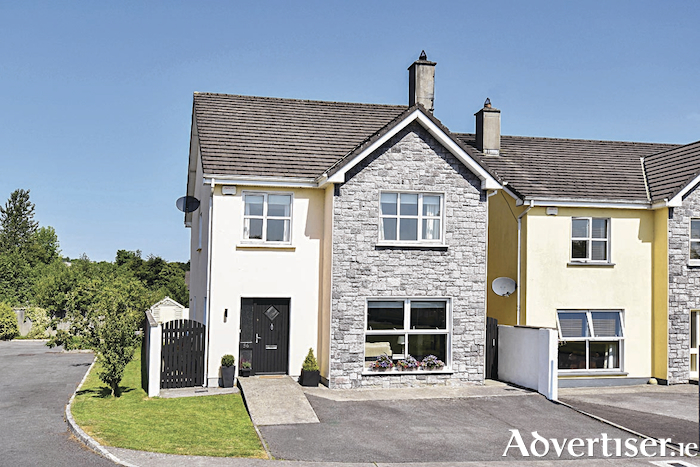 The property is located within a 20 minute drive of nearby Galway city, UCHG and NUIG. This property would prove to be the ideal owner occupier residence, retirement or holiday home. Viewing is highly recommended and is guaranteed not to disappoint. Ber C2 , asking price €360,000.